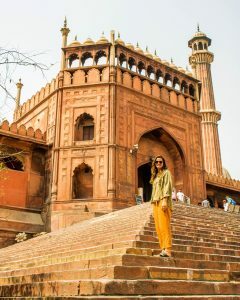 A beautiful mess and organised chaos, those are first things that come to my mind when I think about my incredible trip to India with Intrepid Travel. It’s safe to say that I never considered myself a group tour kind of traveller. 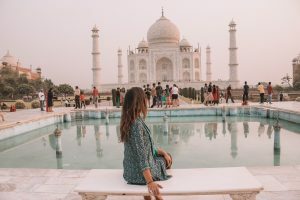 I have been lucky enough to have travelled in different countries and I always enjoyed the freedom of travelling by myself. 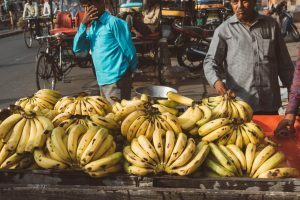 Well, Intrepid Travel’s India Vegan Food Adventure has completely changed my mind. I always thought tours would take their guests to touristy restaurants or to those spots considered a “safe bet”. 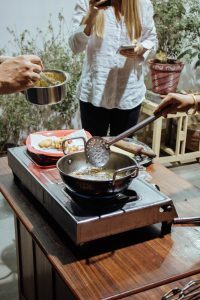 Without our incredible guide Chetan, I would have never experienced four amazing home cooked dinners (which are by far some of the best meals I’ve ever had). 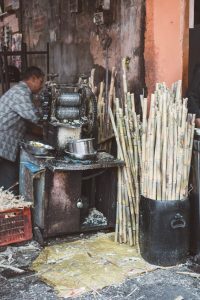 I wouldn’t have felt safe to eat so many different delicious street foods (you’d normally be advised not to eat from street food stalls) and I would have probably struggled to avoid ghee (a clarified butter from northern India that is widely used to cook any dish, vegetarian or not). 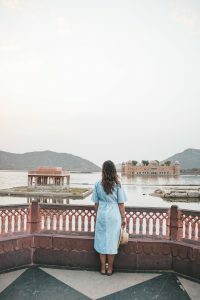 Below you will find my travel diary, I really hope you enjoy it and I hope I can somehow transport you to all the incredible places I have been. 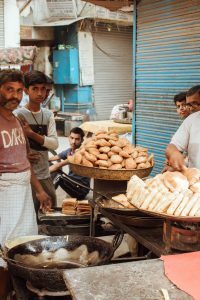 We started our epic Vegan Food Adventure in Delhi, by far one of the most overwhelming cities I have ever visited. 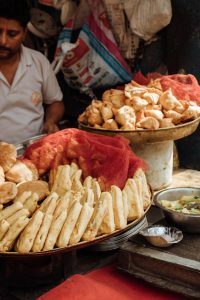 Our super knowledgeable guide Chetan took us around the narrow streets of old Delhi to taste some typical Indian street food. The highlight was definitely the deep-fried chickpea samosas (Chetan made sure they were cooked in oil), which were full of fragrant flavours and with a lovely spicy kick at the end. 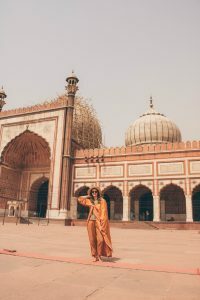 We continued our tour and we visited Jama Masjid, a local mosque, we then headed back into the chaotic streets of Delhi where we paid a visit to one of the many chai wallahs who has been selling the famous chai tea for over 35 years! Now, it’s basically impossible in north India to have dairy free chai, so our guide Chetan brought a carton of soy milk with him. Needless to say, it was utterly delicious and obviously the best chai I have ever had! 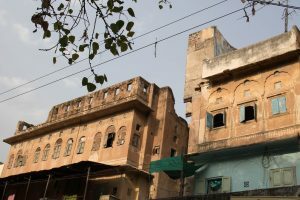 We carried on through the intricate streets of Delhi to get to our lunch destination. It was a very small restaurant on the side of the road overflowing with locals (we were the only western people) and again Chetan made sure our food was cooked in oil not ghee. My favourite thing was cauliflower stuffed paratha dipped in a green chutney, so full of flavour! After lunch we headed to the Sikh temple and to the Sikh community kitchen, which offers up to 19,000 free vegetarian meals every single day! It was so fascinating to see this incredibly organised huge kitchen working so harmoniously to provide free delicious food. 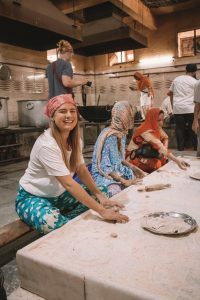 We had a go at making chapatis too (with various results) and it was definitely one of those memories which will stay with me forever. After an hour long drive we arrived at Greenr, a California-inspired vegetarian café with all the food a vegan can dream of! 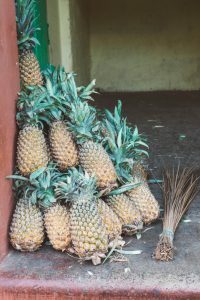 We had delicious smoothies and juices, kombucha, sweet potato and cassava fries, hummus and raw desserts. 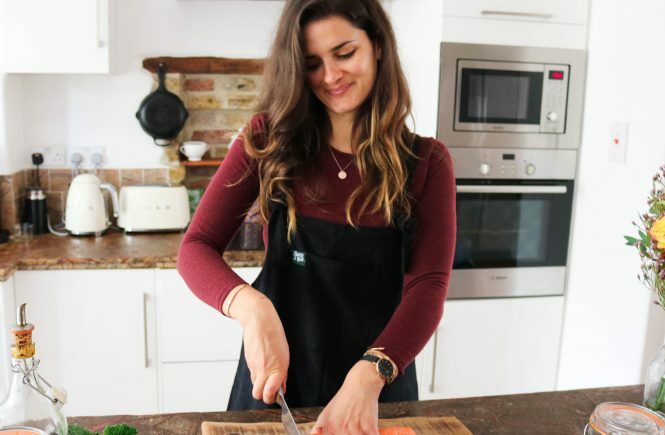 Everything was utterly delicious, and we loved the chilled vibes so much! For dinner we were invited to one of Intrepid Travel tour guide’s homes where we had the chance to learn some cooking skills from her incredibly talented mum. We obviously had a real feast and I had a second go at making chapatis (better this time). After dinner they dressed us all in traditional Indian outfits (us ladies we all wore gorgeous saris) and they taught some Bollywood dance moves. It was so much fun, and it was so great to be part of the life of an Indian family for one night. 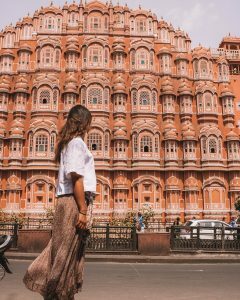 With a dedicated van we left Delhi and we headed to Jaipur, also known as the Pink City. 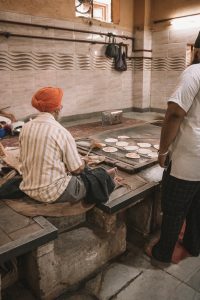 Our first stop was a kachori restaurant where we had the chance to try some traditional Indian snacks. 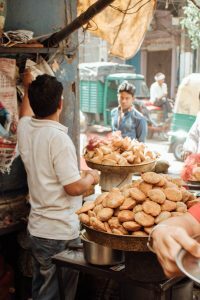 We had the famous kachori which is basically a veggie curry between two slices of bread dipped in a chickpea batter and deep fried. It was so delicious! Full of flavour but not too spicy. Chetan also brought some traditional Indian sweets made with cashew and almonds. The almond one tasted like marzipan and they were both dangerously addictive! 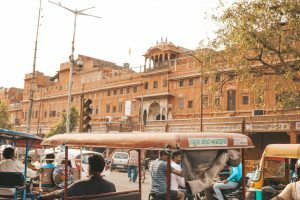 We then headed into Jaipur Old Town and as in Delhi everywhere was buzzing with life. For dinner we were guests of another lovely Indian family who showed us how to cook pakora and jeera potatoes. 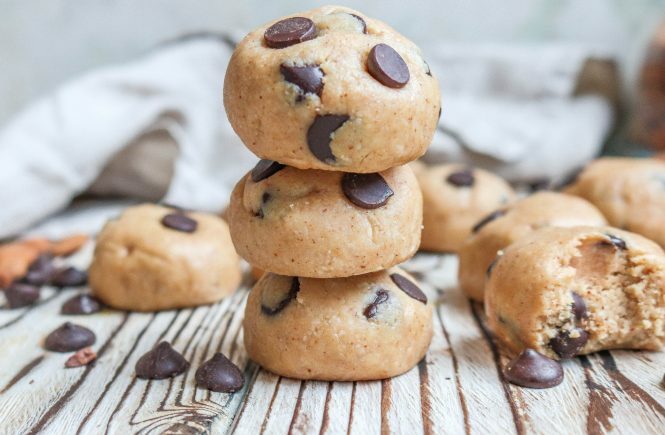 They were so simple to make but so delicious! I will definitely make them again (watch this space). We then had dinner together in their beautiful courtyard and we watched a puppet show with some music which they organised for us. Cannot thank this family enough for this incredible experience! Day 2 in Jaipur started at dawn, we went out around 5 o clock in the morning to catch the sunrise over the water palace. It was so lovely to see the city not quite as busy and buzzing as during the day. 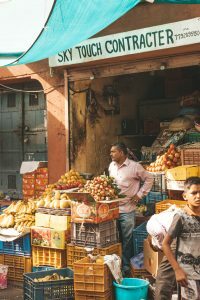 After the sunrise we went to the fruit and veggie market which was literally heaven! 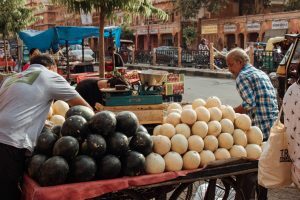 You guys know how much I love my fruit and I can honestly say Indian mangoes were just the best mangoes I’ve ever tasted! 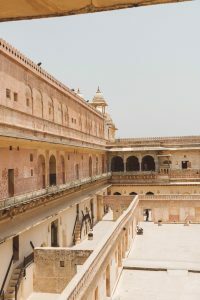 After a quick breakfast at the hotel we headed to the majestic Amber Fort, a huge castle with incredible long walls stretching for kilometres. It really felt we were in the middle of a Game of Thrones episode! In the evening we caught a Bollywood movie and then it was bedtime as after such an early start I was exhausted. 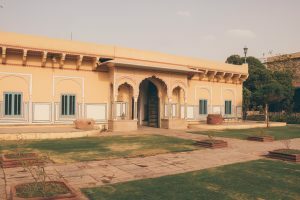 We left the beautiful Jaipur to make our way to Kanota, a small town between Jaipur and Agra. 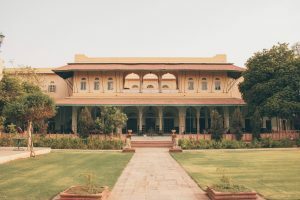 In Kanota we had an overnight stay at the beautiful Kanota Castle, home to Jaipur royalty. 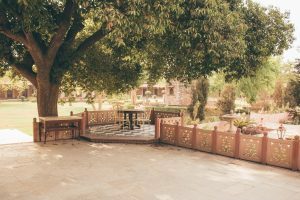 The castle was sprawled over a vast land with gorgeous gardens, trees and incredible silence which was a stark contrast to what we experienced so far. 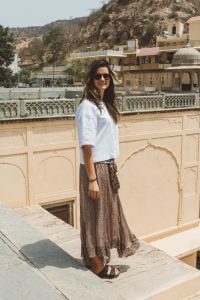 In the Kanota Castle they also filmed some of the Marigold Hotel movie scenes, it was utterly decadent and for 24 hours I definitely felt like an Indian princess! We had dinner with the family which still owns the castle and it was so interesting and fascinating to hear the tales about their great grandfather who built the castle in 1876. 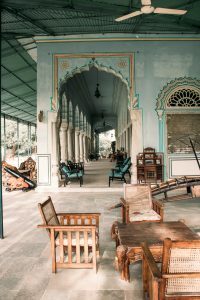 It was by far one of the most charming hotels I have ever stayed and that night I really slept like a queen. Bright and early in the morning we left to reach Agra. For lunch we had take-out little boxes which a restaurant on the side of the road had made for us, it was by far the best packed lunch I have ever had! Pakoras, jeera potatoes, paratha and some lovely dipping sauce, my lunch box will never taste the same! 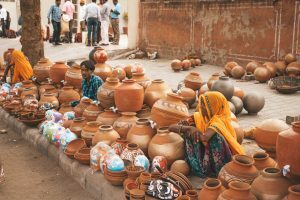 Agra was as buzzing and busy as Delhi, if not more! 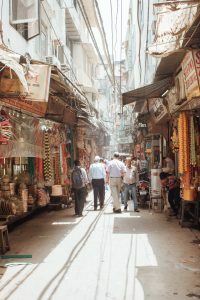 Our first activity was to visit the spice market which was intoxicating, literally! The smell of spices was so strong we just couldn’t help coughing or sneezing! For dinner we got to enjoy another incredible homecooked meal from a family who taught us a little bit about Mughlai cuisine which is traditionally really rich in meat and dairy products. They made a lighter version for us focusing on vegetables instead. They taught us how make a fried potato dish which traditionally would have yogurt in it, but they substituted it with cashew cream instead, it was so delicious! (another dish I definitely want to remake at home). 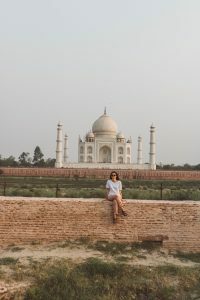 It was bed time again after dinner as we had to get up at 3.45 the next morning to visit the iconic Taj Mahal. At 4.10 in the morning we were all ready to go. 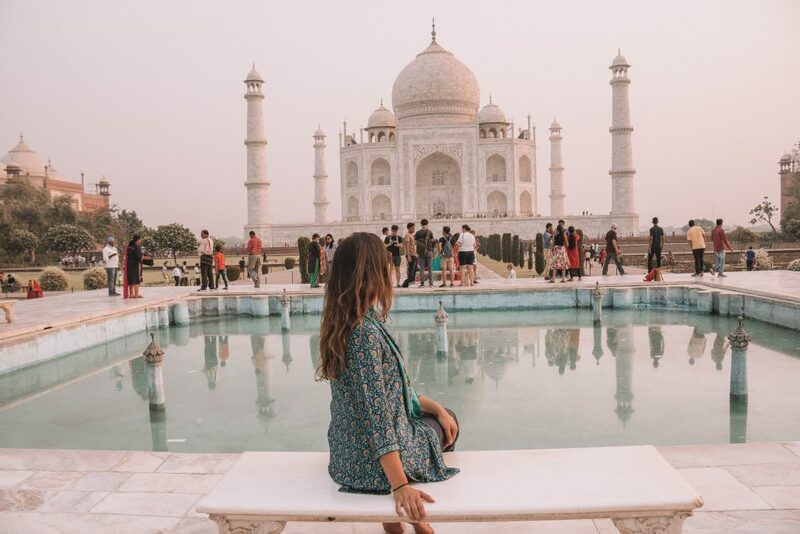 We got to the Taj Mahal just before 5 and I can proudly say we were the first in line and for about 10 minutes we had the palace all for ourselves! (it can get really crowded especially during the day time)The Taj Mahal was built by Shah Jahan for his wife and mother of his 13 children. As she was dying he promised her to build something utterly unique, so she would have never been forgotten. It was without the shadow of a doubt an incredible experience especially visiting it at sunrise. The light was golden, and it felt so peaceful and magical. Sadly, it was time to leave Agra but before starting our 5-hour drive back to Delhi we stopped for lunch at Sheroes Hangout, a cafe run by women survivors of acid attacks. Although the restaurant is vegetarian they prepared a full vegan lunch just for us. We also had the chance to watch a short documentary about the stories of these women, most of the acid attacks were actually performed by members of their families. Not surprisingly we were all in tears, it was so emotional to hear all the pain that these women had to go through in order to be where they are now. It made me appreciate even more what I have back home which most of the time I just take for granted. 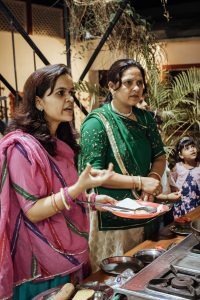 Thanks to this cafe and this charity these women now have a career, something they can be proud of and also a chance to spread awareness about acid attacks in India. After such an emotional lunch we were back onto our minibus on the way to where we started, Delhi. 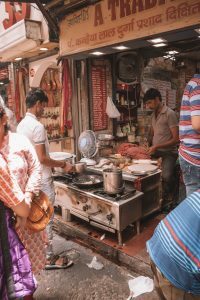 When we got to Delhi we had our final dinner in a restaurant just on the side of the road, which once again I would have probably never gone to if I was by myself. The restaurant specialty was dosa which quickly become the group’s favourite dish. 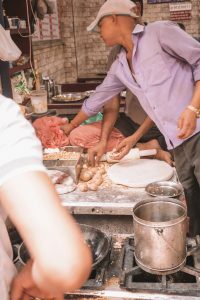 Dosa is a thin pancake traditionally made with rice flour (gluten free) and is stuffed with a variety of different things, we had it with potato, cauliflower, raisin and dipped into a coconut chutney. I just loved the crunchy pancake with the soft filling, another recipe I definitely have to remake at home! Sadly, the next day it was time to say goodbye to my amazing vegan family as the Vegan Food Adventure was officially over! You have no idea how sad I was to say bye to our wonderful team, to our invaluable guide Chetan and to Intrepid’s travel staff members which have definitely made our stay extra special. 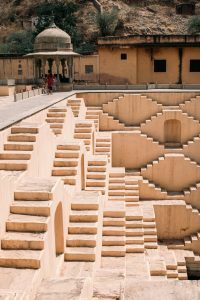 I have been back from India for just over 2 weeks now and I am already day dreaming of visiting this truly unique and beautiful country again. I have never felt so constantly fascinated by my surroundings, everything everywhere was mesmerising, exciting and stimulating. I don’t think anyone could ever get used to India, from constantly honking, stray dogs, holy cows peacefully strolling alongside the traffic, cheeky monkeys eating stolen mangoes on a scooter, incredibly pungent smells of street food, spices and open sewers, to impeccably ladies dressed in bright saris with ink black eyes, India is everything and more than your body and soul can ever take in. 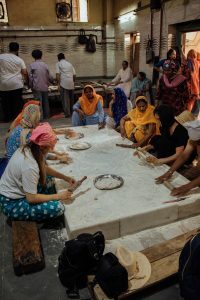 1- Visiting the Sikh temple community kitchen in Delhi and making chapatis. It was so fascinating to see so many volunteers coming together and somehow managing a super organised kitchen which provides up to 19,000 free meals every day! 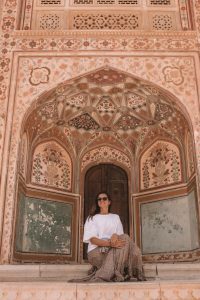 2- Visiting Amber Fort in Jaipur. It was just so vast and magnificent, and it really felt like the time stopped. 3- Trying street food. 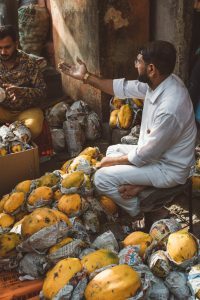 The buzzing and at times overwhelming streets of India will stay with me forever, I felt myself constantly looking at market and food stall vendors, so many different dishes and much fresh produce on offer! 4- Home cooked dinners. 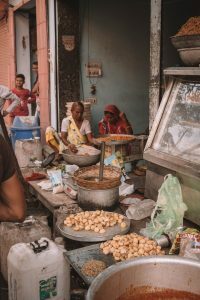 I will be forever grateful to Intrepid Travel to have brought me to 4 different homes where I had the chance to learn how to cook from mothers and grandmothers, something absolutely priceless. 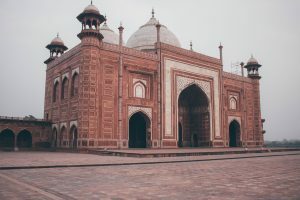 5-Taj Mahal. 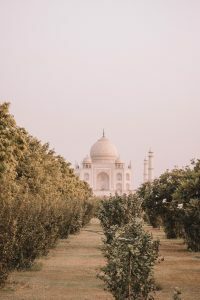 They say, “you haven’t seen India if you haven’t seen to the Taj Mahal”, although I am not sure I necessarily agree but the visit to the Taj was definitely one of those pinch-me moments. 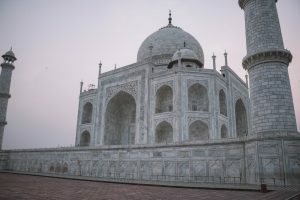 So majestic, jaw-dropping and beautiful especially when visited during the golden hour of sunrise. 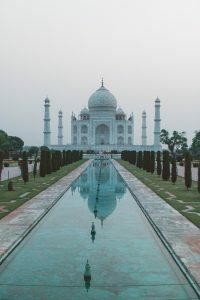 1- Intrepid Travel is against any animal exploitation, so they don’t include any activities where wild or domestic animals are mistreated on their itineraries. This includes elephant rides, snake charming, zoos, aquariums and more. They also actively discourage their travellers from supporting or taking part in these activities. 2- Intrepid Travel is committed to reducing single use plastic consumption on their trips where possible. For example, we were invited to bring our own reusable water bottles with us, so we could refill them with filtered water when we had the chance.